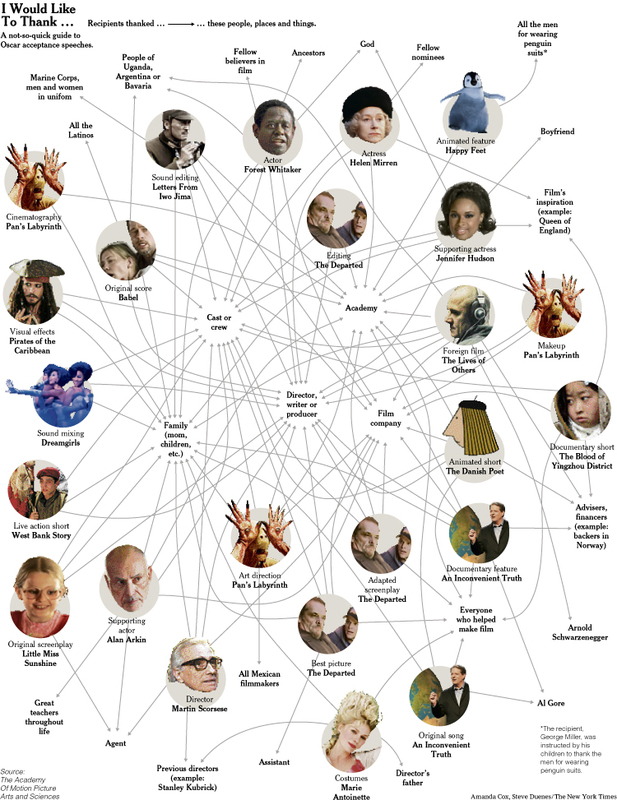 This arrived by way of Stanley Wasserman at the SOCNET Listserv (from the International Network of Social Network Analysts) – The NYT’s Social Network analysis of who Academy Awards winners thanked. As you can see, family, directors, the Academy, the film company and the Cast and Crew were by far the most “thanked”. This is fantastic example of how a sociogram can help researchers pull out trends from a mish-mash of data. FYI, I’ve been rather quiet lately in my own network of analysis, Second Life, because I’m currently seeking trends in the 9K+ strong network I’ve captured. First images (anonymised, of course) coming soon. ~ by aleks on March 1, 2007. Very cool! Thanks for posting such great stuff. You have a great talent in writing, good post my friend!